Looking for Assistant Professor jobs in Arts and Science Colleges 2019 in Tamilnadu? or Searching for Faculty Teachers Tamil Nadu April 2019? FacultyON.com is the best place to get accurate info about all faculty vacancies in all colleges and universities. 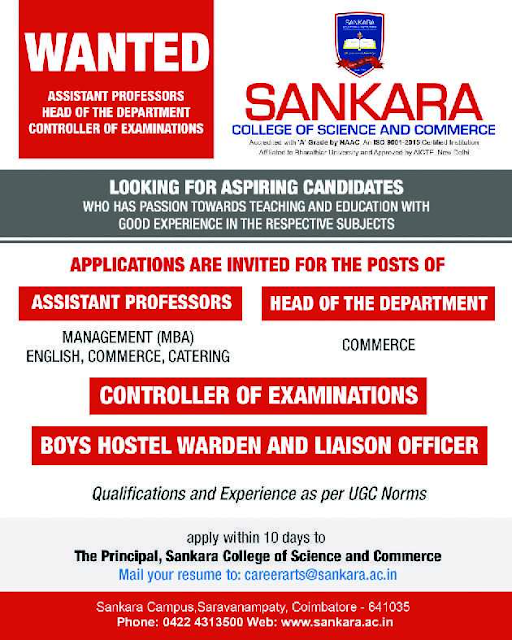 A college based in Coimbatore called Sankara College of Science and Commerce, Coimbatore has advertised in THE HINDU newspaper for recruitment of HOD / Assistant Professor / COE / Warden jobs vacancies. Interested and eligible job aspirants are requested to apply within 10 days from 10th April 2019. Check out further more details below. About College: Sankara College of Science and Commerce is an Arts College in Saravanampatti, in the Coimbatore district, Tamil Nadu. It is approved by the All India Council for Technical Education and is affiliated with Bharathiar University. How to Apply: Interested candidates are requested to send their detailed application along with CV, copies of certificates and recent PP size photo to the postal address or email address provided below.